Over the summer, Gus went on a whirlwind adventure to Egypt - touring the pyramids, the white desert, the Nile. While sleeping in a dorm at my summer job, I awoke to a text from him at 4:30am - a picture of his head in front of the Sphinx. You can imagine my jealously. But leave it to Gus...all my jealously evaporated when he arrived home and showered me with gifts... most of them of the fabric variety! This fantastic printed fresco fabric has the feeling of lightweight cotton, but is considerably more durable. Fresco is a very lightweight wool...I found a good description at The Gentleman's Gazette. I guess its no surprise that Egyptians have perfected hot weather fabrics. Sorry this picture is so yellow. 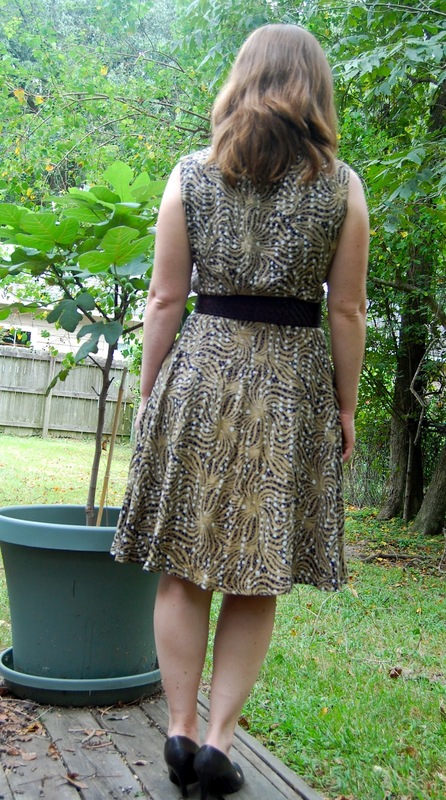 My current philosophy of sewing patterns is to choose something with elements I haven't tried before. 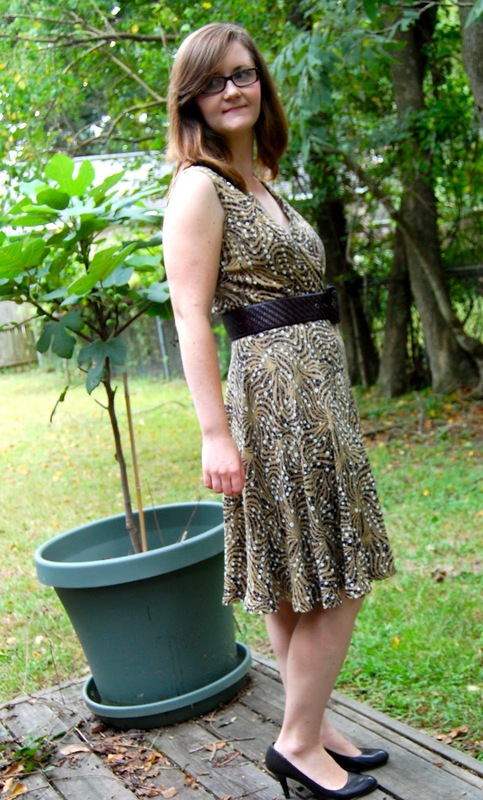 With that in mind, it was time to add a wrap dress to my repertoire. Closure: Tie on the inside panel, hook and eye on the outside panel. I finished this dress last Saturday and I've already worn it twice. It debuted at the Ira Glass event at LSU on Sunday night. Three cheers for public radio! Then I wore the dress to school on Monday (the day before Hurricane Isaac put us out for a week.) It did very well in the humidity. I did have to pin the neckline together. I plan to add a snap at the neckline to keep it in place without worry. Wow! This is gorgeous. You're so good at this! Where did you learn to sew? I'm seriously considering taking a class. How much should I expect to pay/how long will it take for me to become as awesome as you? This is beautiful! What great fabric! Nice you don't have dust and lovely gifts. the dress looks beautiful. I'd be hesitent to use a wool fabric for a kind of drapey dress, but it falls very nicely. just proves that you've got to breake the rules sometimes.